This is a beautiful work of art crafted from cast bronze. 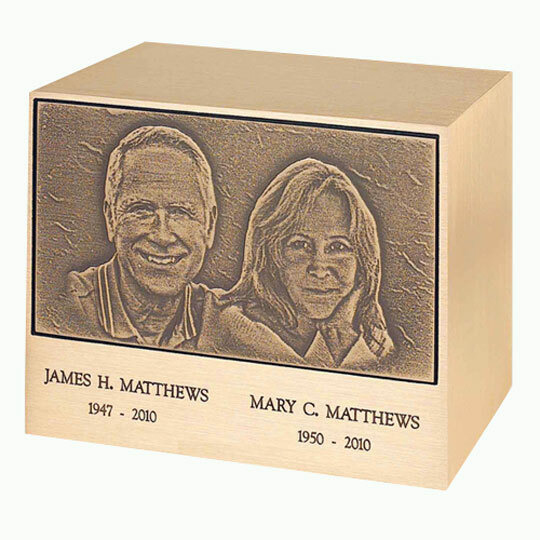 You can submit a photo and we will create a cast relief portrait for a truly lasting memorial. This is a custom work of art and can take up to 8 weeks to complete once we have the proof approval. For best results please send a 300 DPI image or better no larger than 5 MB in a JPG format. Please call us at 800-511-095 if you have questions. We will work with you to produce a memorial urn that you and your family will cherish. An engraving proof will be emailed for your approval prior to completing the 3D photo plate. Ships in two separate pieces, the urn and the engraved photo plate.